In pre-combustion processes, a solid fuel such as coal is turned into a gaseous fuel through a high-temperature conversion process known as gasification. The fuel gas produced from gasification contains: hydrogen (H2); carbon monoxide (CO); CO2; hydrocarbons, such as methane; and, a number of other compounds. This fuel gas then undergoes a reaction known as a water-gas shift that converts the CO and water, added in the form of steam, to CO2 and H2. 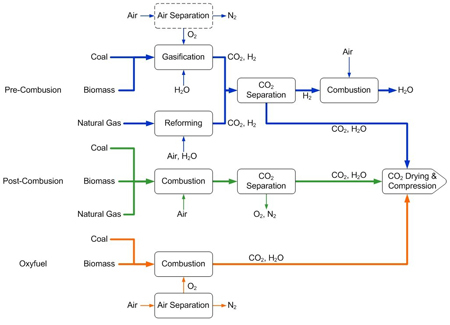 CO2 created during gasification and from the water gas-shift reaction is removed from the fuel gas using a process called absorption. In absorption the fuel-gas contacts a liquid into which the CO2 dissolves, leaving the other parts of the fuel gas behind. The CO2 is then be prepared for transport, while the fuel-gas is burnt in a gas turbine to generate electricity. In post-combustion processes, a solid or gaseous fuel is burnt in the traditional way (for example, is a boiler or gas turbine) producing electricity. The exhaust from the turbine or boiler contains CO2, but at very low concentrations. Using an absorption process, similar to that used in post-combustion processes, the CO2 in the exhaust is removed and prepared for transport. In an oxyfuel process, a solid fuel such as coal is burnt in a way that is slightly different from normal. Usually coal is burnt in air and, because air contains a large amount of nitrogen, the exhaust from the boiler contains a relatively low concentration of CO2. In the oxyfuel process, coal is burnt in a mixture of CO2 and just the right amount of oxygen to allow combustion to be completed. Thus, the resulting exhaust is nearly pure CO2. Some of this CO2 is recycled and used for combustion in the boiler, while the majority is prepared for transport. The captured carbon dioxide can be transported using tanker trucks, rail cars, ships and pipelines. The best method of transport depends on the locations of the capture plant and storage site, the distance from source to sink, and the quantity of CO2 to be transported. However, a typical power plant produces large amounts of CO2—usually more than 1 million metric tonnes or the mass of 2500 fully-loaded jumbo jets—and as a result pipelines and ships are the only viable options to transport CO2. Geological sinks suitable for storing captured CO2 include: deep saline formations, depleted gas reservoirs, oil reservoirs, and coal beds. Storage of CO2 in operating oil fields and coal beds are referred to as enhanced oil recovery (EOR) and enhanced coal bed methane (ECBM) recovery, respectively. EOR has been used as a means to recover oil since the 1970’s. 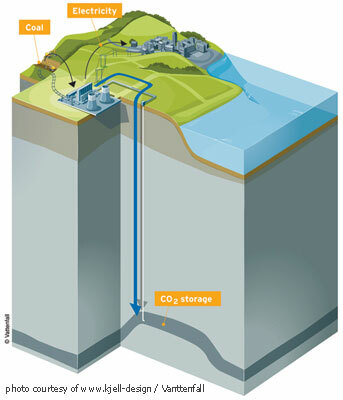 Storage of CO2 in saline formations has been occurring a project located in the North Sea began to inject CO2 separated from natural gas deep under the seabed as opposed to releasing it to the atmosphere. Many more CCS projects are in the planning stages. Additional details can be found in the IPCC's Special Report on CCS.